Where Do We Stand in the World of Higher Education? An article written by Jocelyne Le Boeuf. Our will to evolve curriculums stems from a project-grounded method, a will to knit close ties between all higher education institutions (universities, private institutes, etc.) 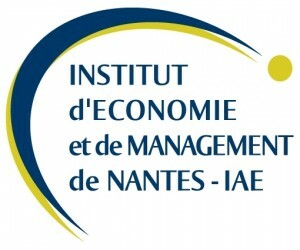 and to go global: basically the guidelines advocated by the PRES (Pôle de Research et d’Enseignement Supérieur) Université Nantes-Angers-Le Mans which our school has been a member of since November 2009. Because it has been has acted in the academic scene for many years our school has become proficient in setting up projects with companies and business clusters. We have also widely developed our international activities. In 2007 – Christian Guellerin, Managing Director – was elected President of Cumulus, a worldwide network that gathers 140 institutions of art, design and media. A subsidiary was opened in Qingdao, China, for more than 2 years and a new one is about to be launched in Bangalore, India in September 2010 with Srishti School of Art and Design. To enhance and strengthen our postgraduate curriculum we created new topic-oriented Master’s programs with a focus on social and economic issues or on a specific field of application. Our aim is to foster a human-centered, ethically responsible kind of design in tune with the ongoing economic globalization. Our school proudly aims to do away with the educational patterns that prevail in applied arts without rejecting their founding principles in doing so, and to implement courses that train designers for leadership and management careers by teaching them high-level skills – both theoretical and practical – and an expertise in one of the available topics. Lecture-type classes and projects are taught and carried out as part of prospective partnerships with business clusters. They feed on our interaction with research labs run by universities and top-tier institutions. 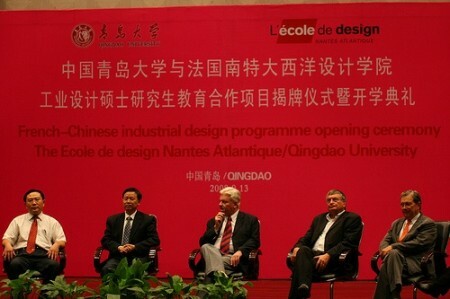 Inauguration de l'antenne de L'École de design à Qingdao en Chine, septembre 2008. The designers’ innovative approach to projects is more and more acknowledged by industrials, tertiary service providers and all professionals willing to change the world. Our field of action is faced with many great challenges, not the least of which is the need to gain recognition in the world of research and to be acknowledged as a true research discipline. erent in the interaction between theory and practice. Artistic and technical knowledge, the knowledge and questions derived from human sciences and management are put into practice by students as they carry out long-term projects. This chemistry is the very key to creativity, the only way to acquire the ability to handle the complex methods underlying the design process. Teaching objectives (which know-how and knowledge must the student acquire? Through which methods?) are part of a project-induced dynamics that gradually takes shape in several steps that will each raise new questions and face students with fresh choices they shall justify. 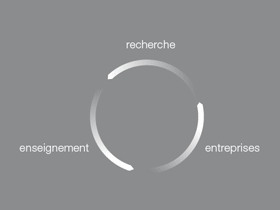 The research-project method is grounded in the great emphasis put on projects in all design school curriculums. Followers of this method do not only consider design as a profession. By implementing this method our institution aims to take a research stance based on scientificity criteria that will enrich design education and the economic fields where design applies. To take this research stance, we are willing to train our faculty and to set up collaborations with research labs from universities and top tier higher education institutions. We are positive much innovation and knowledge will arise from the implementation of cross-disciplinary teams where the creativity and innovation ability dear to design projects will collide. Our research activities on the international scene mainly rely on our Director’s and faculty’s participation in symposiums, conferences and publications all over the world. Our institution takes an active part in organizing research seminars and publishing research-oriented documents. A bilingual French-English research journal, CADI, was co-founded in 2008 by the International Development Department and the Direction of Studies (editorial coordination by Frédéric Degouzon, Jocelyne Le Bœuf and Morgane Saysana, translation by Morgane Saysana). To this day three issues have been published and widely distributed among the Cumulus network. Two of these issues are collections of interviews with experts who supervised our fifth-year students. They bring to the fore the virtuous, fruit-bearing interactions between design and sciences: human sciences and engineering sciences. - CADI, 2008, Experience Design, articles by David Bihanic, PhD in arts and design, Paris 1 University (La Sorbonne), researcher at the laboratoire d’Esthétique théorique et appliquée, Project studio director at Les Ateliers-Paris Design Institute and Yann Le Guennec, digital artist, head of the research unit in Virtual Reality. - CADI 2009, Knowledge Transfer(s) 1, interviews with Frédéric Kaplan, researcher in artificial intelligence at the Ecole polytechnique Fédérale de Lausanne (Switzerland), Marie-Thérèse Neuilly, researcher in sociology and psycho-sociology, Annie Hubert, anthropologist, Pascale Gauthier, researcher in pharmaceutics, Bruno Bachimont, Head of the scientific department of the INA (French National Audiovisual Institute). - CADI 2010, Knowledge Transfer(s) 2, interviews with Laurence Nigay, researcher in man-machine interfaces, Stephen Boucher, consultant for the think tank “Notre Europe,” Henri Samier, Associate Professor at ISTIA, University of Angers, Céline Gallen, researcher in marketing at IAE IEMN, University of Nantes who is now a member of our research group on new eating habits.